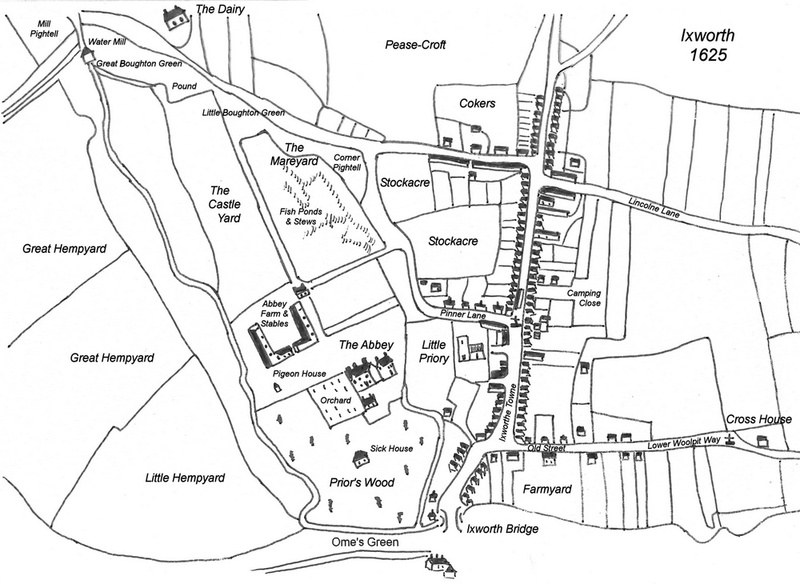 The earliest known map of Ixworth was created in 1625 to show the land holdings of the Lord of the Manor John Carill Esq. That map was then copied by hand in 1834. The 1834 version was deteriorating when, in the 1970s, a local photographer recorded it. That record, in the form of a pair of large black-and-white prints is available to see at the Suffolk Record Office in Bury St Edmunds (reference no 1991). The quality of the print is not enough to be able to read the smallest details (mostly the names of individual tenants on the land) but it still gives a fascinating insight into early Ixworth. A sketch of the central part of the village as seen in 1625 is reproduced here. The main features of the village are still clear to see (the main streets, Dairy Farm, the Abbey, Cross House etc.) but there are changes and intriguing features. The names given are all new to us; the lower High Street is Ixworthe Towne and part of Stow Road is Old Street, this reflects the fact that Ixworth’s first houses were in this area close to the river. Further out, Stow Road is Lower Woolpit Way, presumably a common destination for travel in those days. Crown Lane is called Lincolne Lane and this is thought to be a corruption of Limekiln Lane. Commister Lane is Pinner or Pinner’s Lane where it meets the High Street, a crease in the map may be hiding the ‘s’. On the Pakenham side of the river, Ome’s Green stretches west from Bridge Farm. The first market to be granted to Ixworth took place at the lower end of the High Street where it widens out with the junction of Stow Road. By 1625 there is a market cross in the road at the Commister Lane junction and a short row of simple buildings along the High Street opposite the Pickerel Inn. These probably reflect market stalls and to this day the pavement is much wider on that side of the road. The market cross is commemorated by the cross moulded into the plasterwork on the front of no 19 High Street. There is also another way-side cross in Stow Road which seems to mark the limit of habitation and was known as the Townsend Cross, note that it is close to Cross House. Leading from the High Street somewhere near the present Methodist Chapel, and paralleling the houses behind, is the Camping Close. This was a feature of many East Anglian towns and villages and had nothing to do with life under canvas. Camping or ‘camp-ball’ was a cross between football and handball, not unlike modern rugby or American Football. The game was far from gentle, being very energetic and dangerous with records of frequent injury or even death. There were many variant forms (some played with sticks) with different names and sizes of pitch, one of which used church-porches as goals! This was a place to let off steam in a bawdy fashion; being often played on a Sunday it was roundly condemned by the Church yet tolerated by the local clergy and gentry. There are several lost features along Thetford Road; close to the Water Mill was Great Roughton Green, where the Round House now stands was Little Roughton Green and between them was the animal pound. The present-day allotments stand on Corner Pightell and the large field to the north of the road was Pease-Croft. The Abbey buildings are little changed but there is an orchard to the side of them, a Pigeon House nearby and a Sick House in Prior’s Wood to the south. To the south of the bridleway leading out to Hempyard Bridge there was a complex of farm buildings and stables just before the river, a fenced-off area of rough ground stands there today. There was also what looks like a gate-house at the end of the grassy path which leads from the bridleway to the Round House on Thetford Road. Hempyard Bridge itself is named for the hemp fields to which it led. The long agricultural field to the north of the bridleway is intriguingly called ‘The Castle Yard’ although there is no evidence that there was ever a castle there – it may have been the site of an early manor house, perhaps with a fortified appearance. The ditches to the north of the bridleway are ‘fish ponds and stews’ and there seems to be a water channel leading through them directly to the mill. An area call The Mareyard overlaps the fish ponds and the verges of Thetford Road. Where Abbey Close stands now is an area called Stockacre; this was not necessarily where the livestock were kept but it did belong to the Lord of the Manor and still did in 1890 when the church asked for part of it to be used as the new Ixworth cemetery. The Ixworth Village website is run by a committee and looks after the interests of the village online. We are independent of any village organisation and interest and take a long term interest in the village. Hi, there was certainly a blacksmiths at the bottom of the High Street in the late 1940s and maybe to the 1970s when I lost family connections to the village. I believe the name was Thurlow. Certainly I remember horses being shoed there.